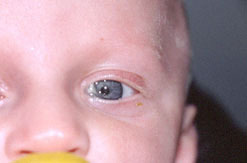 A watery eye can be the product of excess tear production (hyperlacrimation), disturbed ocular surface tear flow (lid mal-position) or disturbed outflow (epiphora). Occasionally all three mechanisms can be involved. Epiphora is due to some form of compromised drainage which may be caused by: a) punctal phimosis, b) canalicular stenosis and obstruction or c) naso-lacrimal duct blockage. Obstruction of the naso-lacrimal duct may be congenital, in which case it is most usually due to delayed canalization of the valve of Hasner, or it may be acquired. In adults the commonest cause of epiphora is primary acquired nasolacrimal duct obstruction (NLDO) which is associated with inflammation of the naso-lacrimal duct. Epiphora in the presence of a patent lacrimal system to syringing and in the absence of excess tear production or lid malposition is defined as functional NLDO. Management of less common causes of epiphora such as congenital facial abnormalities and secondary acquired obstructions are not discussed in this article. Symptomatic NLDO occurs in approximately 5-6% of infants. A sticky, watery eye with positive regurgitation on pressure over the lacrimal sac confirms the diagnosis. Other diagnostic measures such as probing or dacryocystography (DCG) may be combined with treatment under general anaesthesia. As there is a high spontaneous rate of remission (60-90%) in the first year of life, probing should be delayed until 10-12 months of age1, 2. Parents can be instructed to undertake lacrimal sac massage during the intervening period. Earlier probing is only justified if there is severe recurrent infection. Probing of the naso-lacrimal duct is the first line of treatment3. However probe failure increases with age and is known to double every 6 months 1. For this reason and in cases of persistent epiphora, a second probing two to four months later is advocated. In failed cases with persistent epiphora and recurrent infection, it may be necessary to perform a dacryocystorhinostomy (DCR). Alternatively bicanalicular silicone intubation with Crawford, Juneman or Ritleng tubes can be carried out with a claimed success rate of 88-95%4, 5. Causes of disturbed ocular surface tear flow such as lid malposition (euryblepharon, punctal ectropion, punctal phimosis) or ocular surface irritation (dry eye, blepharitis) should be excluded first. Identification of the site of the obstruction causing epiphora is most important. This information has been shown to dramatically increase the chance of successful treatment.